Andante Alpacas of Old Brick Farm near Stewkley in Buckinghamshire, was established in 2009 with the purchase of three breeding females which we bought locally. 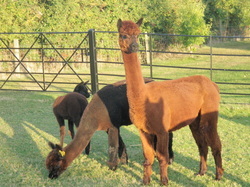 Within three months we had decided to increase the herd (and colour range) by purchasing two pregnant black females. And so the fun began! Mark works in London and looks forward to the weekends when he can get away from a desk and out into the paddocks to be with “his girls”. Caroline has a background in agriculture but has only had the opportunity to put her knowledge into action having moved to Old Brick Farm upon her return from the Far East at the beginning of the 2000s. As well as keeping alpacas on the farm the family enjoy raising Jacob Sheep, pigs, geese, ducks and chickens. There are a couple of retired ponies and several dogs to complete the animal family. Mark and Caroline have four children most of whom have now flown the nest and one of whom is a very useful vet! Caroline joined the Heart of England Alpaca Group at the start of her alpaca life and soon got involved in the running of shows, joining the British Alpaca Society fibre committee and she is now heavily involved in the organisation of the 2012 Alpaca Conference to be held at Keble College in April 2012. Both Mark and Caroline have attended a variety of courses during the last couple of years all of which have increased their understanding of these delightful animals and their superlative fleeces. Caroline is very keen to see a huge growth in the fibre industry in Britain as she fully appreciates the many fine qualities of alpaca fibre. Breeders of the British Alpaca Society's National Fleece Show 2013 supreme champion. Andante Balthazar is available for matings. Please contact Caroline at: caroline@adantealpacas.com for more details.